I hate trying to spread cold butter on bread, but have always been concerned about the hygiene of just leaving a stick on the counter. Until I got a butter bell I'd just deal with the cold butter. A friend of mine, Margaret, first introduced me to butter bells and I love mine. She was getting a few for Christmas presents for her family and I had never heard of them before, so of course had to ask. I immediately ordered 1 for myself and 1 each for my mother and mother-in-law. 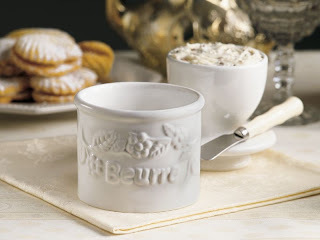 I have the White Classic Crock Butter Bell from ButterBell.com. A butter bell uses water to create an airtight seal, so I use cold filtered water and replace it each morning. I can have soft butter and don't have to worry about the hygiene aspect anymore. Now THAT is a tip I can use, I get so frustrated trying to spread butter on my bread. I had no ideal that this even existed!Thanks so much. O my goodness!! Have the heavens departed??? This is such a wonderful, Amazing idea!!! I love it! No more having to nuke my butter for 15 seconds to soften it! Woo hoo!!! I have never heard of a butter bell, this is fantastic, we use butter all the time and these are so neat. I will check into it..